SILVER and GOLD PRICES rose yesterday, and gave it all back and then some today. Like Superman facing Kryptonite, the price of gold couldn’t conquer $1,080 yesterday. Today it lost $27.20 (2.5%) to $1,050.80. Silver slid 53.50 cents (3.8%) to $13.683. On the daily chart the two metals held hands. About 10:00 the PRICE OF GOLD fell through a trap door at 1,065, and by noon had reached $1,048.35. Rest of the day it flattened out, stunned by the fall, I reckon, remaining above $1,050 but progressing not at all. $1,044.50 was the February 2010 reaction low. From that platform gold reached $1,900 in 18 months, never looking back. That came after the March 2008 high at $1,034 and the 2008 intraday low at $681. How much support $1,044.50 will offer today is anybody’s guess. 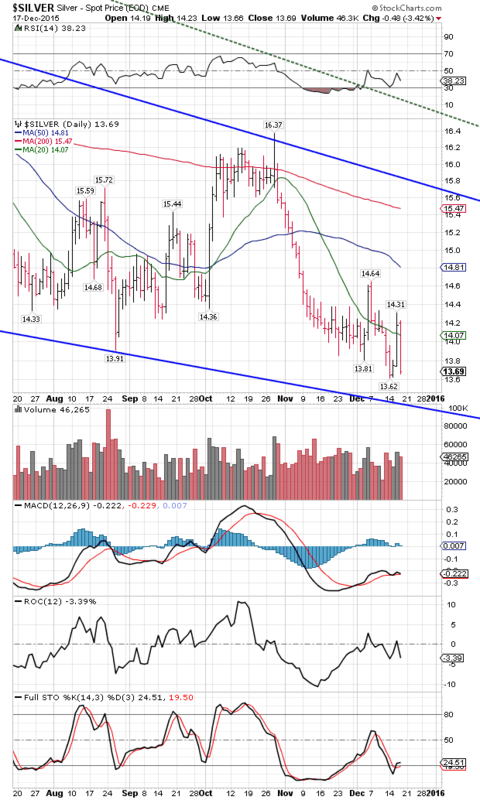 The SILVER PRICE daily chart shows a collapse about 10:00 from $14.00 to a low at $13.69. Remember that I described to you a falling wedge on both metals’ charts. It began in mid-2013. The gold pricein November touched that wedge’s bottom boundary, but silver did not. Today the gold price again touched that boundary. Silver is now moving toward that bottom boundary, about $13.20. 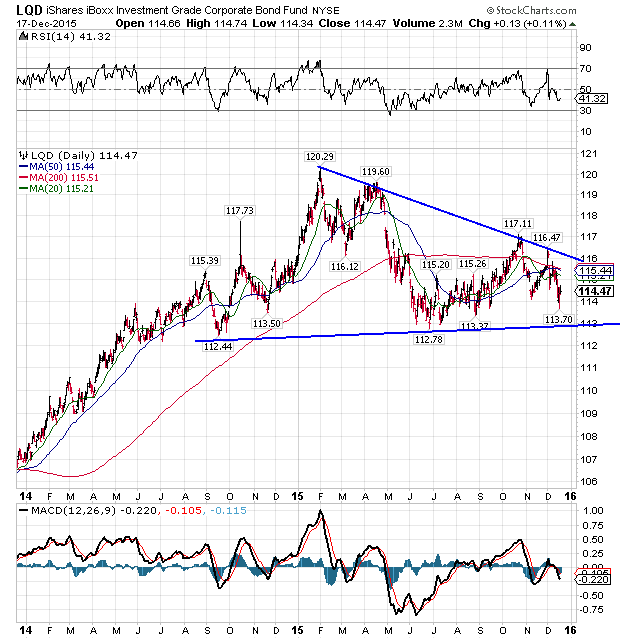 More than that 5 year old support, I would expect both silver and gold prices to turn up from this bottom wedge boundary. But then, I don’t tell ’em what to do, they tell me. Dear friends, the Fed is lost. They have gotten this far on bluster and braggadocio that would do PT Barnum proud, but they are by no means as clever as PT. Stocks are set up to crash, and will in 2016. Bonds are unravelling from the bottom up. Which would you rather own, gold at $1,050 and silver at $13.65 or the Dow at 17,500? I’m just a nat’ral born durn fool from Tennessee that don’t know live stock from a share of stock, but I can answer that question pretty quick. When it comes to a question of trusting the Fed and the financial system or silver and gold, I got no question. Yesterday the Fed raised its discount rate 0.25%, the first raise in nine years. That brings their range to 0.25% to 0.5%. The Fed also committed itself to raising rates to 1% over the next year. Now ponder this mystery with me: the Fed is tightening money supply as the economy is slowing. Make sense to you? Yep, if you want to create a depression. When stocks really tank and scare the ugly out of the Fed (no, not possible), you will see QE4, probably in 2016. 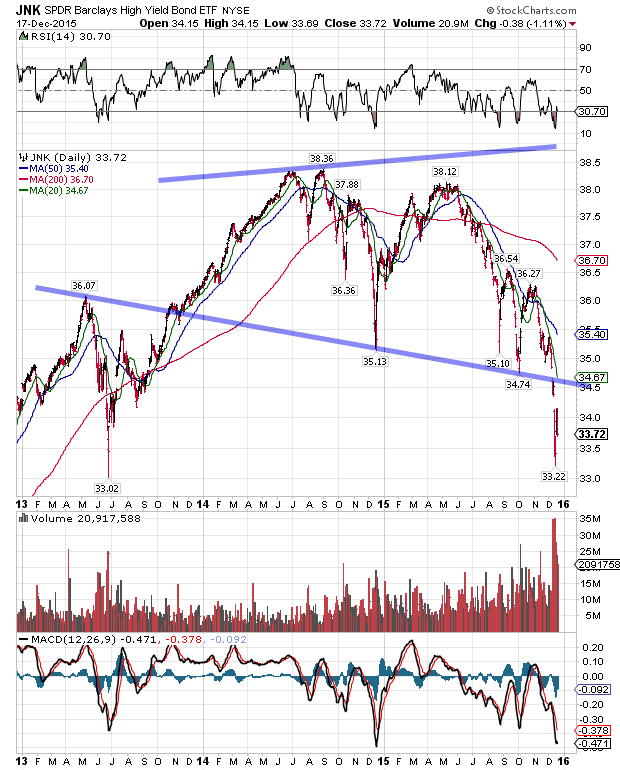 Scarier still is the collapse of junk bonds, which have fallen out of a nearly 3 year gator jaws formation. Like gangrene progressing up an infected foot to the leg, the junk bond meltdown threatens to rise up the quality scale to higher grade bonds, which themselves look none too healthy and are about to drop through the bottom of a 1-1/2 year falling triangle. Owch. Like watching a tornado approach. Stocks first reaction was a big rise yesterday, Dow up 1.28% and S&P500 up 1.45%. They thought better of that today. Dow plummeted 1.43% or 253.25 to 17,495.84. S&P dove 1.50% or 31.18 to 2,041.89. Technically they simply hit the upside-down bowl’s bottom above, failed to push through, and fell back today below the 200 DMA (17,551 and 2062). Now they’ve established a series of three lower highs and three lower lows, which defines a downtrend. One day soon, maybe next month, they’ll fall off the cliff. 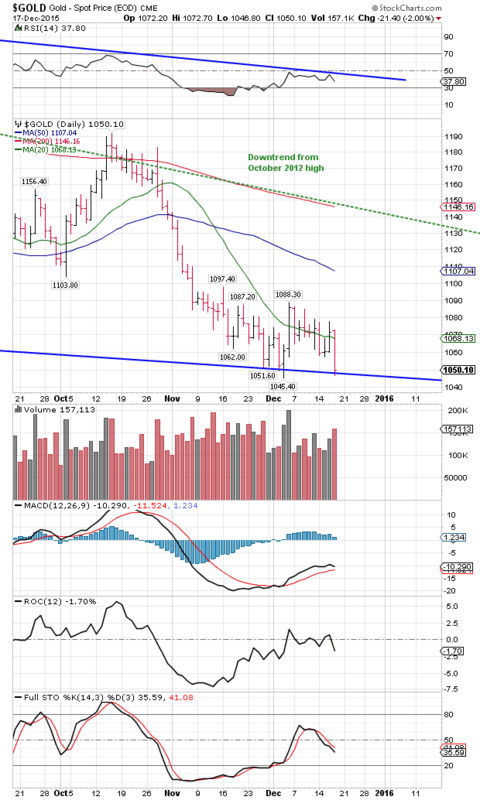 Dow in gold rose today above its 20 DMA (16.66 troy oz) and closed at 16.66 tr. Oz. That remains well below the November 16.85 tr. Oz. high. Dow in silver, thanks to silver’s recent weakness, hit a new high for the move today at 1,278.47, against the last high at 1,274.08 troy ounce. Trying to move higher. US Dollar Index, which averages the value of the scrofulous, scurvy Fern (Federal Reserve note) against other currencies, also fell yesterday, down 0.34% to 97.88. As a “sell the news” move, that made sense. However, today the dollar index shot up 144 basis points (1.47%) to 99.32, punching through the short term downtrend line and reversing direction to UP. Euro sank 0.77% today to $1.0825 while the Yen lost 0.36% to 81.53. What makes no sense in an atmosphere of competitive currency devaluation, is why the Fed would keep the Fern high? And we KNOW that currencies do not float freely, but are subject to all sorts of exchange rate manipulation by central banks. We have to conclude that the dollar is high because the Fed wants it high, it the WHY that escapes me. I suppose, as usual, they are sacrificing US interests — that would be yours and mine — for “higher” interests. 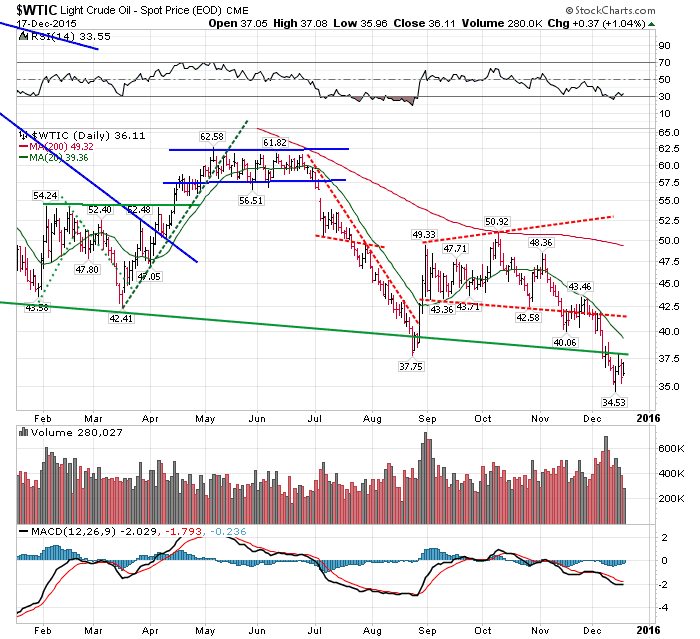 Merely as an interesting aside, West Texas Intermediate Crude has not collapsed, as so many expect. It did make a new low for the post-June decline, but that was earlier in the week and not by much. Yesterday it fell, today it rose. Nor has copper fallen out of bed.